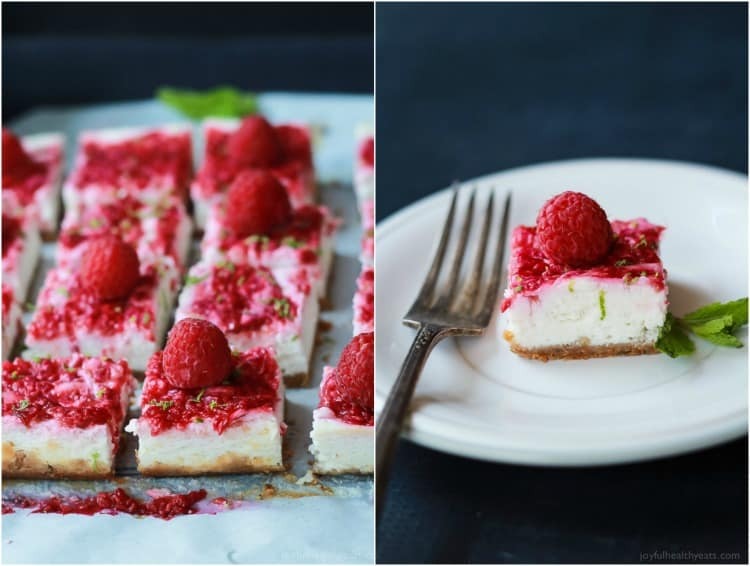 Skinny Raspberry Mojito Cheesecake Bars filled with creamy cheesecake goodness, fresh mint and lime juice, then topped with a fresh raspberry compote – only 130 calories! 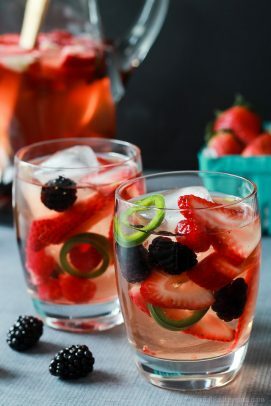 Perfect for summer parties! Ok, that was my first confession. Second is I am obsessed with berries. I could literally do the happy dance every time berry season comes around because that means my grocery bill goes down. We buy 2 pints of strawberries and pint of raspberries and/or blueberries every week! At $4 a pop in off season its not the cheapest – so when berry season is here I am one happy momma and so is my bank account! My favorite berry is hands down Raspberries. The container is never big enough, I could sit and eat an entire pint of raspberries in one sitting … and so could my son. 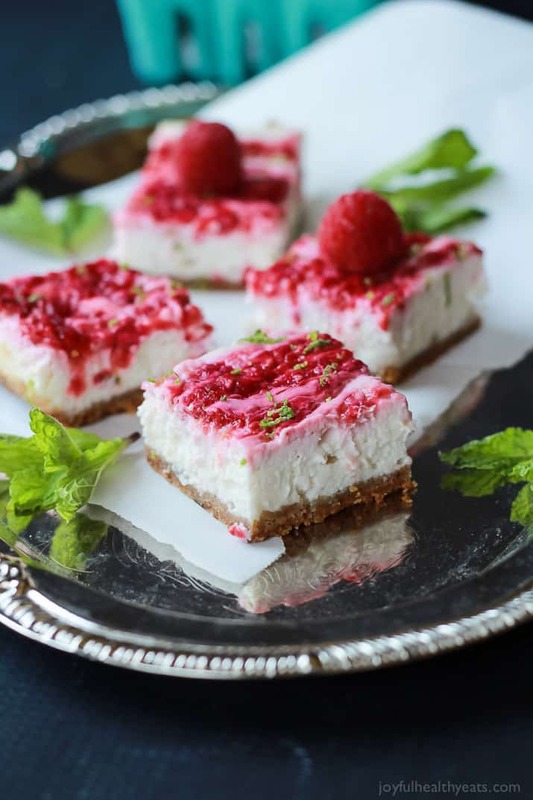 These Skinny Raspberry Mojito Cheesecake Bars are only 130 calories per bar – to put that in perspective an apple is 95 calories so only 35 more! Moral of the story – eat these instead of an apple. No… not really.. but maybe! 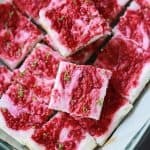 These Cheesecake Bars are made with a base of graham cracker crust, coconut oil and fresh mint. 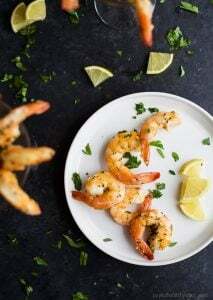 Then topped with a skinny cheesecake filling made with cream cheese and greek yogurt mixed with loads of fresh lime juice and lime zest. 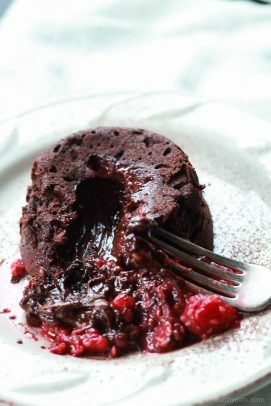 And for the kicker this scrumptious dessert is topped of with my favorite, a fresh raspberry compote that makes the pretty swirl on top! The combination of all these flavors is swoon worthy. It’s the perfect late night treat! 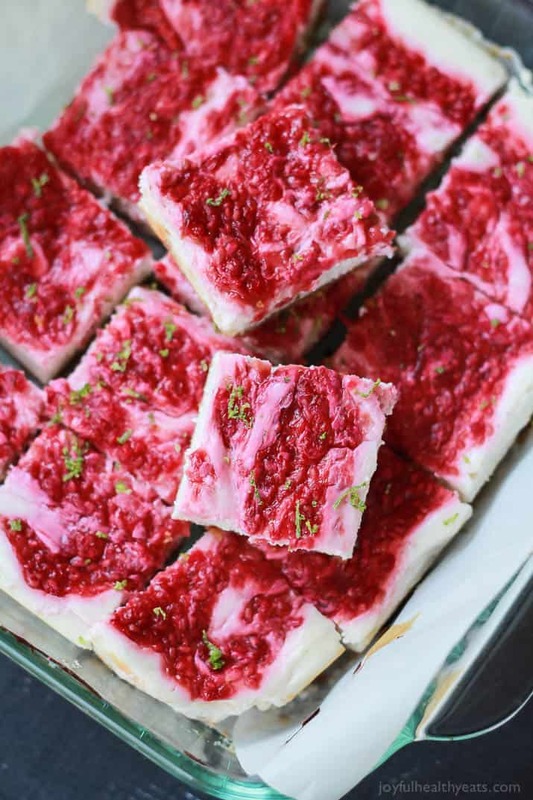 These Skinny Raspberry Mojito Cheesecake Bars would also be a great dessert to bring to the next party you go to – people will be thanking you! 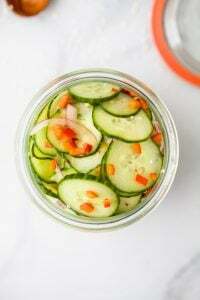 Just a warning, be sure to have the recipe on hand because I know people will want to know how to make it! 🙂 Cheers to Cheesecake! I was compensated for the development of this recipe by Driscoll’s. All opinions are 100% mine. 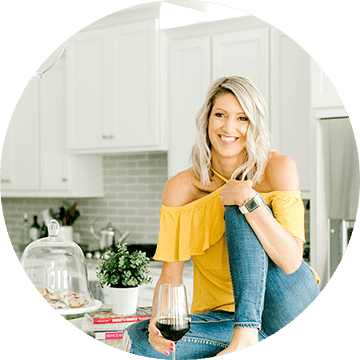 Thank you for supporting the brands that support Joyful Healthy Eats! In a small saucepan, add water, honey, arrowroot, and lime zest. Stir and bring to a boil. Add fresh Driscoll raspberries. Reduce to simmer and simmer for 3-4 minutes, stirring occasionally. In a small bowl, add graham crackers, melted coconut oil, and fresh mint. Mix until mixture is slightly wet. Pour graham crackers in prepared pan and press into bottom for the crust. In a medium bowl mix cream cheese, sugar, and vanilla extract using a hand mixer. Blend until smooth and creamy. Add in greek yogurt, lime juice, lime zest, egg whites, and arrowroot. Blend until combined – be sure not to over blend. 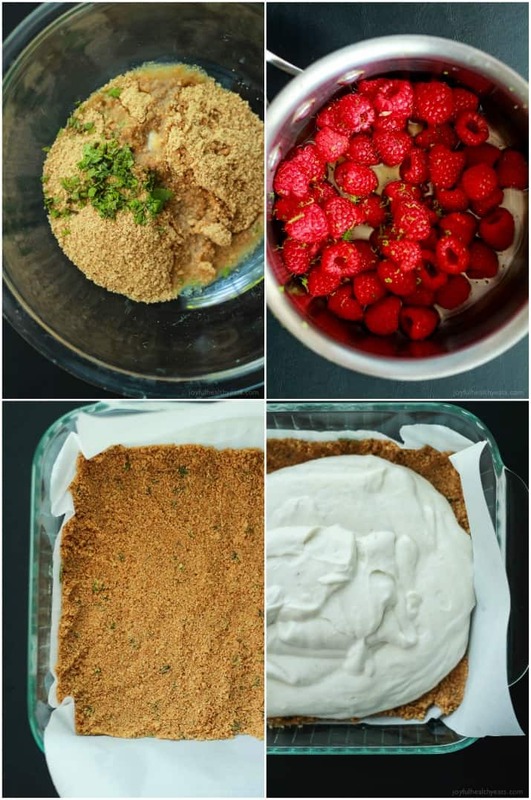 Pour cheesecake mixture over graham cracker crust – smooth out so the cheesecake mixture is even. Pour raspberry sauce on top of cheesecake mixture, using a knife pull knife through raspberry mixture to create a swirl. Remove from oven, place in refrigerator let cool for 30 minutes. Serve. SO I am expecting you to bring a HUGE plate of these next weekend! 130 calories, cheesecake, mojito and berries is the most amazing sentence I have EVER heard. These are gorgeous girl! Pinned! THanks so much Ashley! Two favorites combined in one is always a winner! We were just at a strawberry festival last weekend–you would have LOVED it, I think! Especially if you’re obsessed like I am. I’m also a cheesecake-remedy maker, so two birds of a feather, you know! These look awesome! Skinny. Raspberry. Mojito. Yup, I need these gorgeous looking bars in my life. 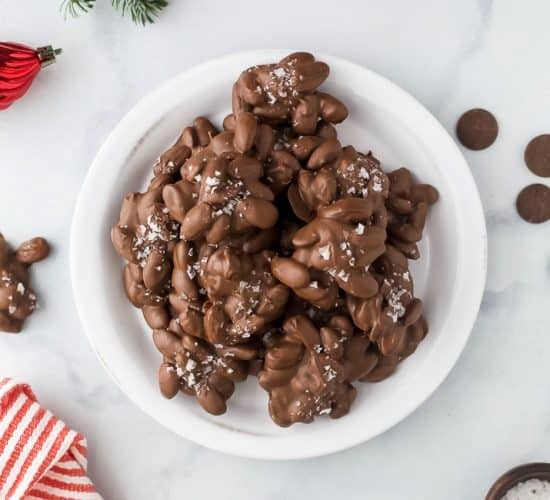 And since they are as healthy as an apple…I’m thinking yes!!! Exactly! Its a sustainable lifestyle for me so I’m going with it and I’M HAPPY thats the key! 🙂 Thanks Kacey! 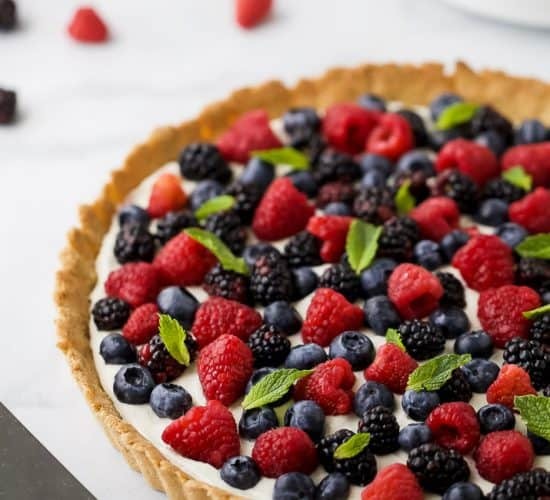 I adore berry season and cheesecake too! And these cheesecake bars look insanely delicious! Loving the skinny version so I can indulge more often! I love that you used coconut oil for the crust, I am going to have to try this! Thanks Julianne! 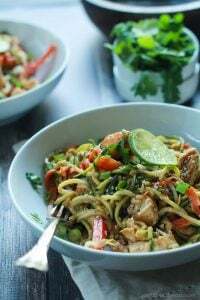 Yes, try it with coconut oil or a mix between coconut oil and butter. Its awesome! Raspberries are totally my favorites, too! 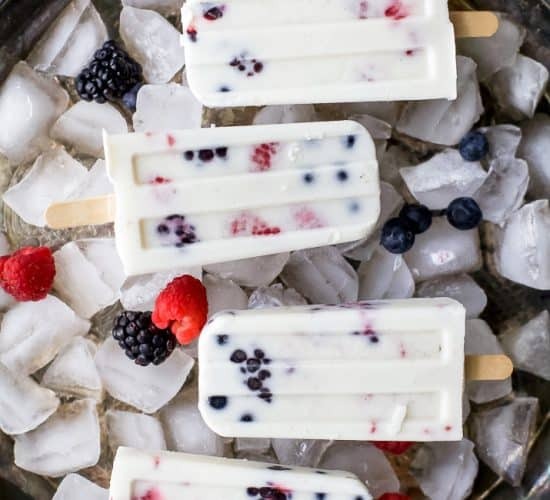 These cheesecake bars look amazing! Yeah for raspberry Lovers! Thanks Denise! I love fresh berry season too! We go through so many pints, I’m not actually sure my bill goes down, but I don’t even care. The flavors in these bars are fabulous!! The color is gorgeous too! Thanks so much for the sweet comments Tanya! I totally agree — it’s all about balance! 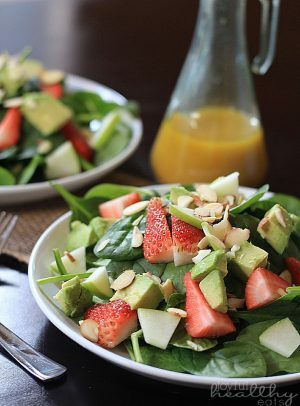 I’m trying to get my 80% over to the healthy side… Lol. So these bars are perfect! 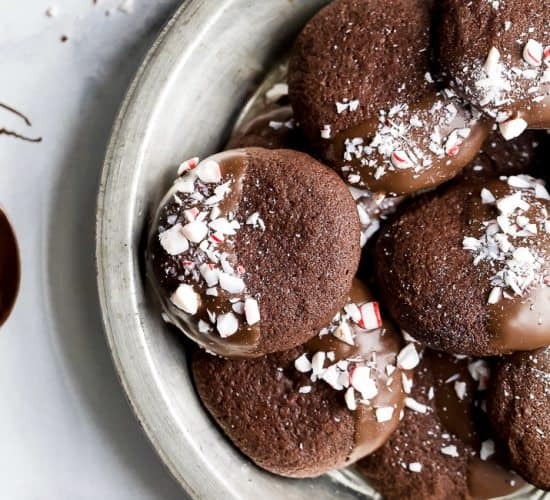 These look so creamy and decadent! Love that raspberry ripple! Thank you Shashi! That raspberry ripple is the best part! haha.. thanks Sara you are too sweet! And skinny bars are always a plus… woot woot! I love that you made them skinny! They’re so pretty. Cheesecake is one of those comfort foods I always turn to as well, skinny is better! Hurray!! Crazy for Crust approved!!! 🙂 Big smiles over here.. thanks so much Dorothy. Skinny Cheesecake all the way! Krista, these bars look absolutely gorgeous! I’m totally with you on the 80/20 rule. We gotta live sometimes, right? Exactly, its no fun to eat veggies and protein all the time! 🙂 Sometimes you gotta give yourself some grace and indulge! So much yum! I once made a mojito fruit dip and with how awesome that was I know I would love this too. 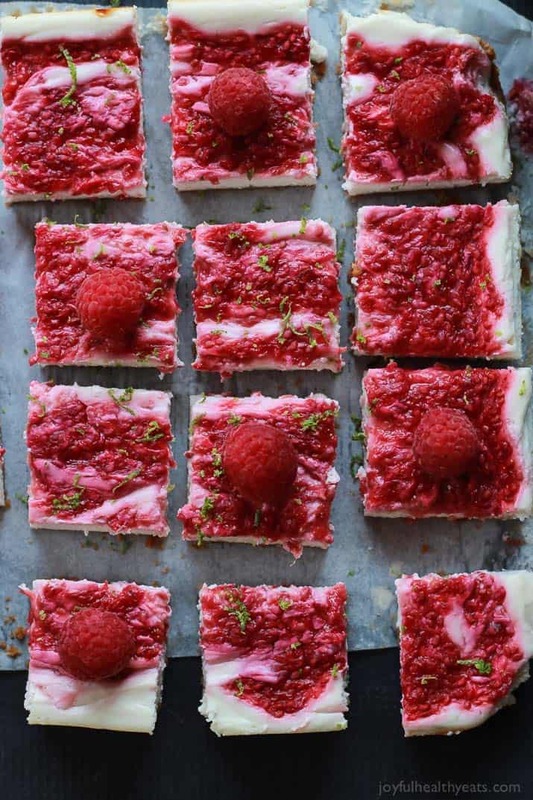 These Cheesecake bars look astounding. Loved it! Super delicious stuff! Oh my… I think these just might be the most beautiful cheesecake bars I’ve seen in my lifetime, evah! They looks absolutely amazing and I’m wishing I had some with the coffee I’m drinking right now! Pinnted! haha.. thanks Kristi you are too sweet! And heck yes these would be AWESOME with a cup of coffee! Oh wow these are gorgeous, Krista. I can’t believe they are skinny too! You are one talented lady! These bars are making my raspberry loving heart soo happy! Such stunning photos! Pinned! haha.. right! 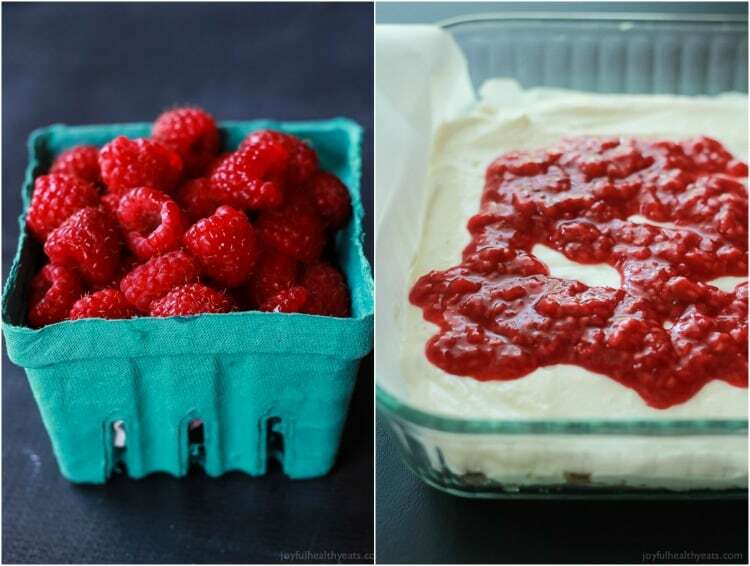 Raspberries make any and every dish better! Thanks for the sweet comment and the pin girl! The calorie count also threw me off my seat! 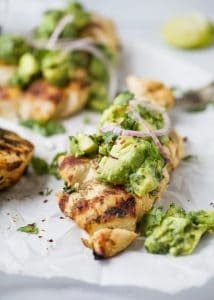 This recipe is AMAZING and perfect for summer! 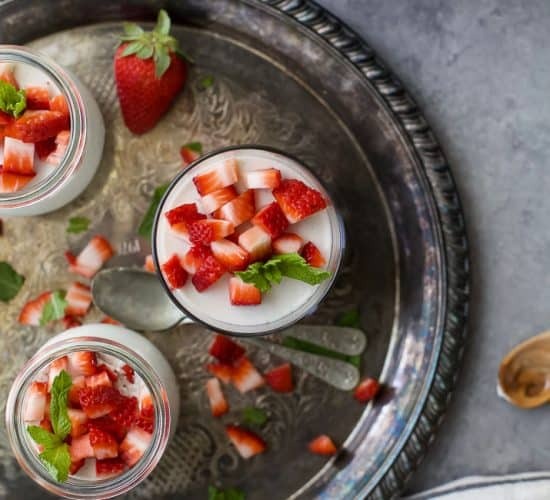 I love cocktail-inspired desserts!